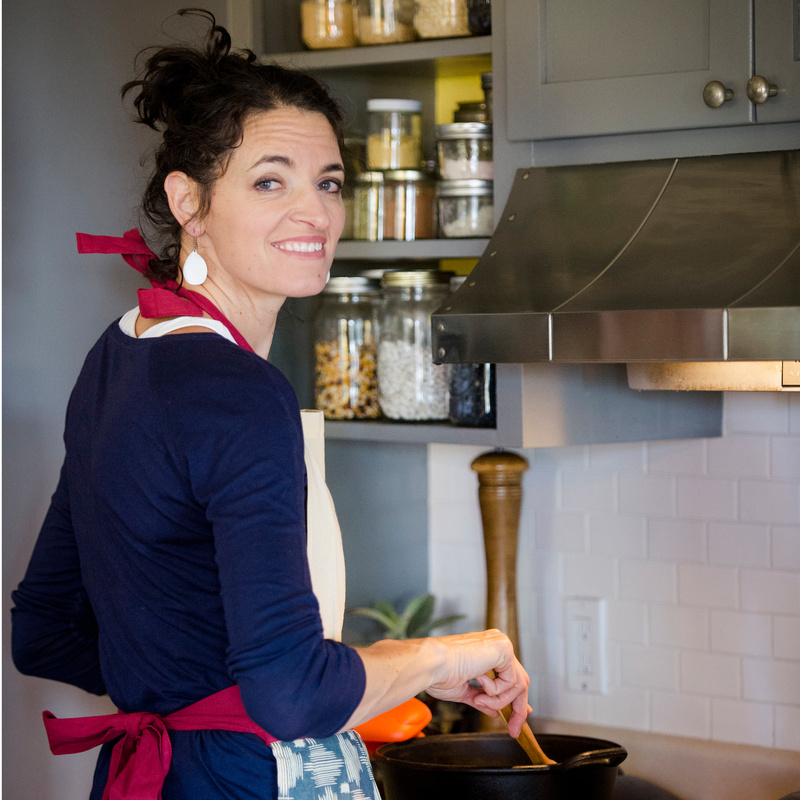 It isn’t every day that you meet someone as passionate about good food as Jamie Truppi. A mom of two with a masters degree in science and nutrition, she works tirelessly to educate others about the health and environmental benefits of locally and sustainably produced food. Growing up on a dude ranch in Idaho’s Frank Church Wilderness, and later on a mini-farm, Jamie and her family foraged for berries and mushrooms, fished in creeks and ponds, preserved seasonal bounties, and cooked just about everything from scratch. In 2018, Jamie launched her consulting business - Jamie Truppi Integrative Nutrition LLC - while developing a farm to preschool pilot program as an AmeriCorps service member for Blaine County Food Council. What drives your passion for food? Well, the taste, for one thing! Seasonal, ethically grown or wild food always tastes better! And, now that I’ve gone down the rabbit hole of how nutrients impact our wellbeing - from a cellular level to symptoms - nutrition is definitely in the driver’s seat. Thankfully, food grown well is also higher in nutrients, so this goes hand in hand. Why is eating food grown close to home so important to you? First and foremost, I want to support the people who are growing food locally. Without them, Idaho would be entirely a commodity state, and we simply cannot survive off commodity food, for many reasons. Also, without them, I would feel unwell - I am very sensitive to chemicals. I appreciate sustainable farmers on a deep level - they are the hardest working, most passionate people I’ve ever met. Second, I’ve always been interested in the environmental impact of our food choices. Oue culture supports big companies, big crops and big money - sadly, individuals are adversely affected by this value system. Food is everything. If we cannot grow food locally, we die. I don’t intend to sound so apocalyptic - I’m really just focused on our future, which I hope is a return to supporting local communities. How do you keep it affordable? I buy in season, in bulk, and make as much as possible at home, from scratch. I batch cook, plan ahead, and prioritize family meals by carving out time in my week to prepare food. Eating out is expensive and “affordable” food typically equates to poor quality food or food that doesn’t serve our bodies well. Plus, who wants to bring two young kids out to “enjoy” a meal? Hmm…. this is a tough one. Geoff Lawton is an amazing man. He’s at the forefront of our global permaculture systems and literally ishelping create food oases in deserts, while staying attuned to cultural norms and environmental well-being. My sister also is pretty incredible. She has a huge garden, saves seeds, plants her own starts, forages and hunts, processes everything from herbs to morels to huckleberries to elk, and shares her bounty and efforts with everyone. This is what brings her joy. What did you learn during your year as an AmeriCorps service member? I could write a novel on what I’ve learned through my AmeriCorps work, and the learning is ongoing! Mostly, I learned how difficult it is to accomplish measurable goals with food. There are so many barriers in our food system, from administration to scheduling to communication to adequate research to finding a “champion” for programming or making changes. People are busy, making it difficult to prioritize weaving food into their systemic processes. And food is emotional, political and personal, making it even harder to break ground with many people and institutions. Thankfully, I also learned that so many people are interested in a better way to improved health, and it’s incredibly encouraging to work with these individuals and organizations. The real challenge is rippling out and inspiring others to come check out how amazing it feels to learn about, grow, eat and experiment with whole, recognizable foods. What are your favorite healthy “local” snacks? Oooh! There are so many! * a thick slice of Hangar Bread, toasted and spread with Picabo Desert Farm’s plain goat cheese and topped with Julie Heneghan’s onion marmalade (which Syringa Mountain School kids helped make). * I’m also fortunate to have a few bits of elk jerky that my brother-in-law made last year. * Kuna Gold or Kuna Calico popcorn, which we make in the Dutch oven with coconut oil and sprinkled with Cloverleaf butter (and not-local sea salt & nutritional yeast) OR my homemade kale chips (from The Hunger Coalition’s Bloom Farm this summer) that I’ve ground into a powder with herbs & spices. Any tips for getting kids to like good wholesome food? Absolutely! First, lead by example. If you eat wholesome foods, your kids will eventually follow suit. Involve kids often in the cooking process: let them choose vegetables at the grocery store; help decide what to cook for dinner; prepare foods alongside you in the kitchen; set the table; garden and harvest, etc. There are so many ways! Finally, give them plenty of wholesome food options. If you want them to eat something, offer it in a location that’s easy for kids to access, such as their own snack drawer. You get to decide what to put in the drawer, and they may choose which of those items to eat. If you don’t want them to eat certain foods, don’t keep those foods in the house. Quite importantly, communicate with other parents about the importance of healthy foods, and help support each other’s endeavors so that more moms are inspired to prioritize wholesome foods. As a busy working mom, how do you find the time to cook? It’s absolutely essential to want to cook. If you’re interested in any kind of cooking, focus on that area. Cooking should be fun and totally worth the effort! Next, figure out what’s practical for you and your family. Then, plan ahead and get organized. This will save both time and money, while improving the quality of meals. Start small. One change is worth celebrating! Finally, get your kids involved. Creating a shared cooking environment means you get to spend time with your kids while teaching them life skills. And, you create a meal together, to boot! Describe your “whole person” approach to nutrition and wellness. I spend a lot of time getting to know my clients. It’s really important to know each person’s story, their beliefs, their values and health history. When we can figure out which factors may have led to or contributed to his/her current state of being, we are more prepared to address the root causes. Also, behaviors and habits, mindset and personality will directly impact the action plan I recommend, and then I allow each client to determine which course of action s/he would like to take based on what feels doable in his/her life at that time. As for interventions, while food and beverages are clearly major factors contributing to wellness or disease, it’s only one area to address. We also focus on sleep, relationships/support, stress and life balance, physical activity, mindfulness, environmental toxins, lab work, genetics and more. It’s impersonal to address only symptoms or disease. I prefer to focus on an individual’s uniqueness and the complex, intersecting factors that affect his/her cellular function and overall state of wellness. I hope to guide every person into a clearer understanding of which foods are best for him or her. Everyone has different needs, and we work together to navigate which foods (including optimal amount, method of preparation, origin, quality, etc.) and eating patterns (time of day, need for snacks, sitting down to eat, etc.) are most effective. I’d like every client to feel more aware of his/her body and how food affects it. Oh my goodness! This is a loaded question. We need corporations to stop producing food on a mass scale and return to the “small farmer” model, and we need to stop subsidizing poor-quality, GMO and toxic foods that are “cheap” and “easy”. Lack of diversification in our food system has led directly to disease, environmental destruction and food convenience. Though I believe deeply in the grass-roots efforts of local communities, it seems that real change will only come from the top. I dream of the day when our federal government wakes up to what’s actually destroying human and natural life, and starts prioritizing better quality food with much improved growing methods; respects small, sustainable farmers; and requires marketing efforts to be factual and science-backed (by good science, not poorly funded science). I would like to see our food culture shift from eating for “health” reasons or need for “fuel” to prioritizing the quality of meals and shared meals. That is, a shift from eating to survive to eating because we truly enjoy food. We cannot enjoy food when we eat processed foods or foods created from poor-quality ingredients; when we consume whole foods sourced from small community farms that are as seasonal as possible, we support our bodies, our families, our community and our earth on a deeper, more sustainable level. Wouldn’t it be amazing if people actually traveled to the Wood River Valley because of the amazing local food culture? That would make me SO happy.